Sino–Latin American relations have experienced an unprecedented growth since 2001, particularly after China joined the World Trade Organisation. Trade jumped from 12 billion dollars at the beginning of the century to the current 266 billion dollars. Beijing became the region’s second largest trading partner, behind the United States, having signed free-trade agreements with Chile (2005), Peru (2008) and Costa Rica (2010). By 2010, China was lending more money to the region than the World Bank, the Inter–American Development Bank, and the United States Export-Import Bank combined, committing more than 141 billion dollars in loans between 2005 and 2016. In 2015, Xi Jinping announced China’s plan to double Sino–Latin American trade and investment in the next 10 years, reaching 500 billion and 250 billion dollars respectively. No balancing actions against China’s increasing influence were taken. In November 2013, former Secretary of State John Kerry stated that the “era of the Monroe Doctrine was over”, in a symbolic but clear expression of Washington’s acknowledgement of the new regional reality. This relationship gradually incorporated more than trade. High-rank visits increased significantly, including Jiang Zemin, Hu Jintao and Xi Jinping’s several trips to the region. Two Chinese White Papers have been released – in English and Spanish – explaining China’s policy towards the region. Beijing has also increased its engagement with regional organisations such as the Andean Community, MERCOSUR, and the Organisation of American States (OAS), and established the China – CELAC forum, which includes the 33 countries in the region, leaving out the United States and Canada. Recent Chinese encroachments into Latin America have raised questions over American hegemony. Historically, the US spirit of Monrovian “backdoor diplomacy” has kept the United States at the helm of Latin America. Yet, since 2001 and the launch of the “War on Terror” campaign, the US has shifted its strategic priorities away from the region, choosing instead to focus on the Middle East. This decision destabilised the regional structure of power and created a geopolitical vacuum that other major powers began to fill, with China being the most assertive. At the same time, Latin America experienced the “pink tide”, a movement that saw many Latin American states turn away from the US-backed neoliberal model and embrace left wing governments. Governments such as Chávez’s Venezuela, Correa’s Ecuador, Morales’ Bolivia and Kirchner’s Argentina aligned with China to expand their foreign policy partners and diminish their dependence on the United States. This helps explain why China has become more assertive in the region, and the United States more distant. For states like Venezuela, China was an alternative that enabled countries to diversify exports of their vast natural and energy resources, stabilising their economies even through the global financial crisis. It was good timing: the “commodities boom” and the pink tide made China attractive for the region, all whilst Washington was looking the other way. This pattern of China’s increasing presence and the US’ diminishing influence in Latin America continued under the Obama administration. The US omnipresence started to show signs of fatigue, despite some symbolic attempts by Washington to reengage the region. Despite Obama thawing US relations with Cuba, Washington’s priorities did not fundamentally change. No major policies towards Latin America were implemented. No balancing actions against China’s increasing influence were taken. In November 2013, former Secretary of State John Kerry stated that the “era of the Monroe Doctrine was over”, in a symbolic but clear expression of Washington’s acknowledgement of the new regional reality. The process of decreasing US influence in the region entered a new phase with the election of Donald Trump. After a year in office, the President has only sent worrisome signs south of the Rio Grande. Insistent threats of building a wall that would be paid for by Mexico; racist slurs against Mexican and other Latin American immigrants; the re-negotiation of NAFTA and US withdrawal from TPP; the end of the DACA programme; the re-establishment of the Monroe Doctrine rhetoric in its original interventionist form, all these developments have taken historically strong US–Latin American relations to their worst situation in decades. Recent polls show trust in the United States has reached historic lows in Latin America. If Washington wants to reverse the situation, this approach must change. It could be done rather easily, if Washington wants to. The United States is still the main regional hegemon in Latin America, with strong economic, political, cultural and military ties. Any suggestion of a hegemonic transition is at least exaggerated. China is not pushing the United States out, it is taking advantage of Washington’s position as an unreliable partner under Trump’s unpredictable government. The Summit of the Americas 2018 was the perfect opportunity for Trump to reassert US engagement with Latin America. However, it turned out to be a lost opportunity. The President decided not to participate in the event in order to focus on the US response to the suspected chemical weapons attacks in Syria, leaving Vice President Mike Pence as the head of the delegation. Pence spent a lot of time discussing the US bombings in Syria, and did not present any concrete policy towards the region. On the contrary, the US delegation continued to inflame tensions, criticising Venezuela and calling for stern actions against Maduro’s government. With some regional support, Pence and the delegation maintained Washington’s position by stating the US will not cede leadership to “authoritarian states”. 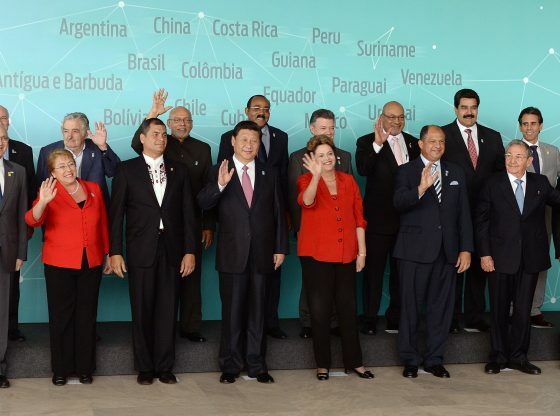 Ultimately, the Summit only reinforced the idea that Latin America is not a priority for the US. Of course, only time will tell what the future has in store for US-Latin American diplomacy. Yet, with no sense of a “re – engagement policy” towards Latin America in the short term, all signs suggest China will continue to increase its presence uninhibited. Diego Leiva is a PhD Candidate at the School of Government and International Relations, Griffith University. His research focuses on Sino–Latin American relations in the twenty-first century. Find him on Twitter @Diegoleivavdm. Image Credit: CC/ Wikimedia Commons.